Connecting you with influencers, bloggers and brands: HelloWellness! Meet HelloWellness co-founders Jenna Sands and Sarah Casden...your new healthy gurus and BFFs. The wellness community has found a home on Instagram, with users regularly commenting on photos, sending each other recipes, and liking food pictures (guilty! )… but the conversation tends to stop there, without going any deeper or fostering any real, meaningful connections. 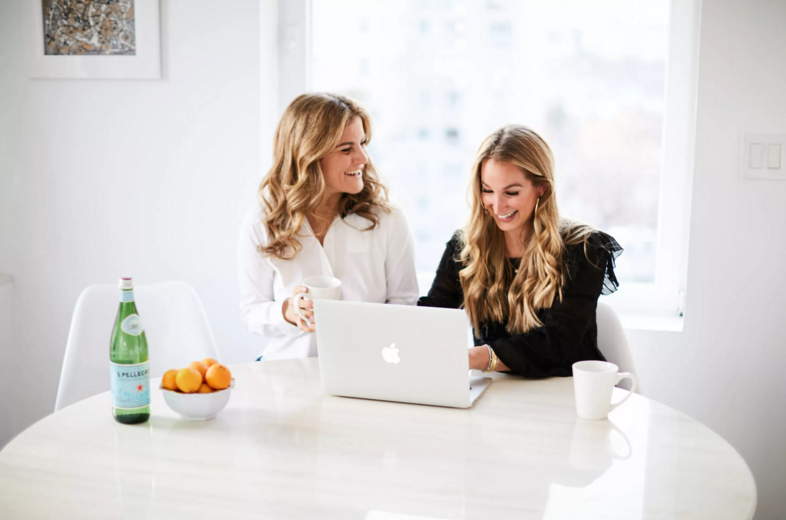 HelloWellness – created by camp friends and New York natives Jenna Sands and Sarah Casden – was founded on a mission to bring like-minded wellness enthusiasts together- IRL. The ultimate goal is to facilitate real, meaningful relationships that go deeper than the ones that solely exist on social media! Jenna and Sarah realized that they weren’t alone in their desire to meet their favorite influencers that they admire, and thus, HelloWellness was born! The platform has taken off, and since the initial NYC launch, has expanded to Miami, Boston, LA and Chicago, and they will soon be abroad, hosting a wellness retreat in Riviera Maya, Mexico this fall! We sat down with these amazing ladies to learn about the brand, future plans, and upcoming events on their radar! What are both of your backgrounds? Sarah Casden (SC): My background is in marketing and Media ad sales. Thankfully it is now completely relevant to what I do, but let’s just say I was a little late to the wellness game. Around the time everyone was defining their major and setting forth their career path, I was prioritizing the bar rather than barre! It wasn’t until years later that I took a vested interest in Wellness when my mother became sick. It was then that I saw how several small lifestyle changes dramatically impacted the way I felt, and I was not only hooked, but fascinated. Shortly, after I went back to school and got my Health Coaching Degree and Nutrition Certification as a Natural Food’s Chef. Jenna Sands (JS): Prior to HelloWellness, I was developing influencer marketing strategies for small CPG companies to grow their brand awareness. Without realizing it, I was forming friendships with people through E-mail and Instagram who I shared similar interests with. I loved being able to connect with these people in real life, and it became my passion to help others do the same. Any notable events coming up? JS: October is a big month for us! We are hosting our retreat October 12-15th in the Riviera Maya, Mexico with SWEAT trainer, and Instagram celebrity, Kelsey Wells! This retreat has everything you could imagine – five-star accommodations, adults-only resort, all-inclusive food, drinks, 24 hour room service, and spa services (yes! all-inclusive spa-services) and daily PWR workouts, nutrition workshops and motivational lectures with Kelsey’s Wells! We are also looking forward to our Charity Fitness Marathon, October 20th and 21st in Boston, NY, Chicago and LA. In honor of Breast Cancer Awareness month, we have partnered with some of the best boutique fitness studios in these studios for a day of fun and fitness, all for a great cause. 100% of ticket sales are donated to Memorial Sloan Kettering Cancer Center for Breast Cancer. Participants can attend one or many workouts, or simply donate to the cause! What is the difference between your HelloWellness retreats and events? SC: Our retreats are a full-blown Wellness getaway! We want our attendees to enjoy a care-free trip with delicious and healthy food, awesome workouts, self-care spa treatments, opportunity to connect with people from around the world, and SO much more! Our events on the other hand, are an awesome way to break up the week, by spending a couple of hours with friends, or making new ones, at a curated themed wellness event such as baking health-ified chocolate chip cookies or learning about how celebrity fitness trainer, Simone de la Rue of Body by Simone built her business. Whether you’re at a retreat or an event, you’ll have an opportunity to learn from an amazing influencer host, discover premium brands in the space, and meet people who are just like you! With health and wellness being at the forefront of what seems to be EVERYTHING – what are some emerging trends? SC: The trend we’re seeing, and most obsessed with, is that of love and acceptance! Somewhere along the way Wellness took a wrong turn as meaning “skinny” or “dieting” and we’re so happy to see it starting to get back on track. Wellness is personal and individualized and should have a positive connotation! Stay tuned for what we have on the calendar in February, as we are dedicating an entire event to ‘body love.’ How ironic that Valentine’s Day is the same month!? JS: We like a bit of everything and love to mix it up! You can regularly find us at Rumble, Body Space Fitness, and dancing our butts off with Amanda Kloots! Also, in preparation for our Retreat with Kelsey Wells, we have starting using her PWR program on the SWEAT app. What are some of your favorite healthy snacks? JS: Lately we’ve been obsessing over Georgia Grinders nut butters, Paleo Passion Foods grainless granola, and Lily’s Sweets extra dark chocolate! For more on the HelloWellness brand and future events, visit: sayhellowellness.com. Join the conversation on Instagram at @SayHelloWellness!